This unique high speed winch system increases launch rates up to 30 gliders per hour. 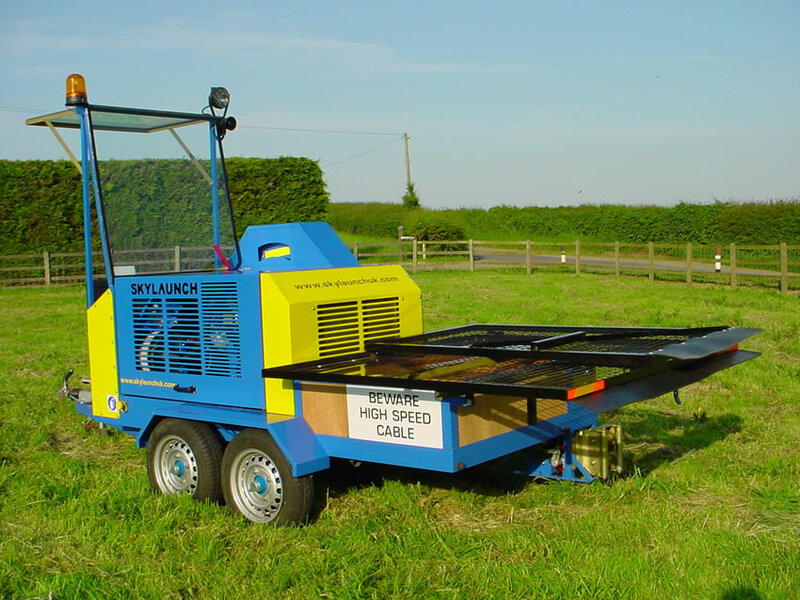 Eliminates airfield damage caused by cable tow vehicle and increases life of launching cable. 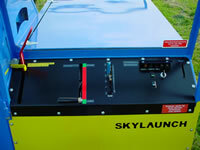 The Skylaunch ‘run free’ design ensures launch heights are not noticeably reduced with this system. 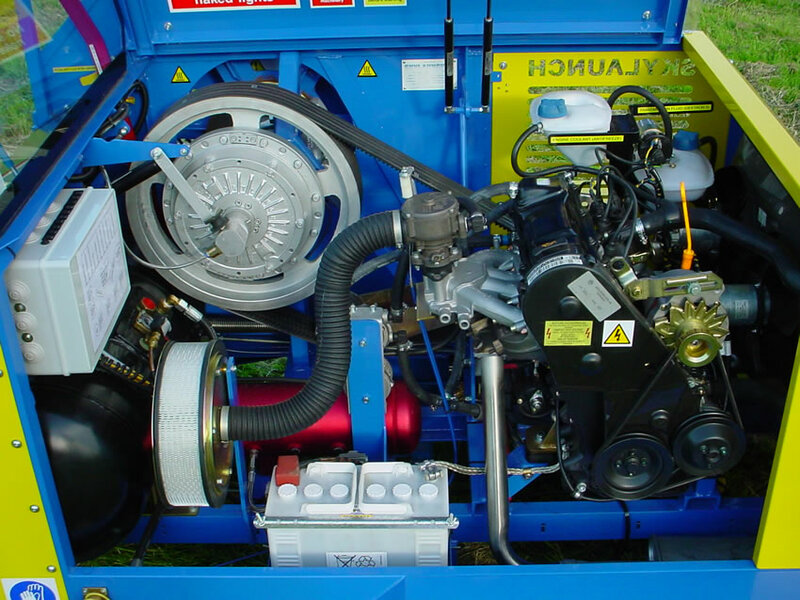 Lightweight winch is easily towed on soft airfield or legally on highway with a car. Chassis pivoting wheel chock (with starter interlock) and trailer handbrake ensures safe/rapid set up for launching. Laminated safety glass screen/roof panel with flashing beacon, signal lamp and siren. Simple colour coded controls are ergonomically positioned for safe/ accurate control. Easy one lever operation with preset speed system. Cable drum brake is automatically controlled. Engine/transmission warning lamps are connected to a buzzer. Panels and covers are easy access with gas strut assistors or hinge mounted for instant opening. Lightweight steel cable drum is reinforced large diameter narrow width type, fully machined and balanced with anti-loop guides. No cable pay-on mechanism is required. Cable feeds onto bottom of drum for safer, trouble free operation. Reliable industrial VW 4 cylinder engine and radiator with two electronic cooling fans. Torque converter on output shaft ensures smooth operation. Final drive with disengage system to free wheel and eliminate drag on the glider. Standard Lockheed disc brake system on cable drum hub for precise control after glider release. Cable entry/exit height is at very low level for safety (and easy access). Heavy duty guillotine, for steel or synthetic cable, activated by powerful spring. All machines are supplied with on-site training, including detailed Operator’s and Maintenance Manuals. VW industrial four cylinder in-line, cast iron block. Industrial bell housing and torque converter system with pulley output for belt drive. VW radiator incorporating two electric cooling fans with thermostatic control. VW torque converter incorporates external cooling vanes. Cooler with thermo-switched fan. VW standard oil/water heat exchanger cooling system. Pulley with clutch and belt drive system, linked to engine throttle and cable drum brake system. Lockheed disc brake and hydraulic twin pot calliper with standard brake pads - same as Skylaunch 2/3 (pad life typically 25,000 – 30,000 launches). High tensile steel 40mm Ø.
Lightweight design, steel construction, machined core and fully balanced. 3,000 metres (2.5mm Ø cable). Any diameter and material can be used. (recommended 2.5mm Ø). Semi-automatic system with speed deceleration control lever. Steel framework with heavy gauge steel panel work and folding roof panel for highway transport. Raised platform with seat. All laminated 6.4mm safety glass with hinged steel mesh guards at front of winch. Warning lamps connected to a buzzer. Cable speed preselector system. Warning beacon, signal lamp, emergency siren, power supply for radio system. Steel channel rails with box and angle section framework. Box section beams with independent trailing arm suspension each end. Each axle 750kg rating. 13” rims (standard trailer 4 stud layout) with 155 R13 tyres. Standard trailer drum brakes with auto reverse system. 50mm ball or Nato ring (other hitch types available). 100 kph / 62 mph (subject to local highway regulations). Chisel and anvil system – to cut steel or synthetic cable. Replaceable high tensile steel pin with roller bearing pivots. Heavy duty coil spring – Permanently tensioned. Machined and hardened from bearing steel or aluminium (for synthetic cables). All standard metric sealed bearings. Typically minimum of 40,000 launches per main roller using steel cable. (Guide rollers will last much longer). Shot blast and powder coat or two pack paint. Shot blast and powder coat or passivate plating. Yellow/blue (developed to give best recognition against typical airfield background). Other colours available. 0 – 130 kph (0 – 80 mph) using auto speed preselector on control panel. Q1 Is it easy to operate? how do I know when to engage the retrieve winch? Q2 How about the main winch? what is different? Q3 We would only need a single drum main winch, are these cheaper? Q4 Does it affect the launch height? is it steel or synthetic cable? Q5 What happens in strong cross-winds on a narrow airfield? Q6 What happens if there is a cable break? Q7 What if the end of the cable is pulled in too far and hits the winch rollers? Q8 How long does it take to retrieve the cable? Q9 How much fuel does it use? Q10 Are parts easily available / servicing straight forward? Q11 Is this system proven and successful over time? <Q1 Is it easy to operate? how do I know when to engage the retrieve winch? Yes, drive lever (go / stop lever) is engaged immediately when the glider releases and the parachute opens, the pre-set speed control is lowered as the launching cable approaches the winch. Cable brake is automatic. After glider release, the operator regains cable tension (as normal), engages neutral and applies tow-out brake or, depending on winch type, controls brake manually. Most drivers comment it is easier than vehicle retrieve systems. The cable drum reel-out is free running. The extra load on the glider is the weight of the retrieve cable in the air, approximately 8 kg for steel cable and 1.5 kg for synthetic (eg Dyneema). Many years ago, several gliding clubs made their own retrieve winches, often using a variety of old parts, but these designs produced much cable tension for the launch (unlike the Skylaunch design), therefore reducing launch heights. This is how the launch height loss “myth” was created. 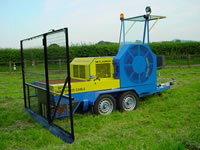 The winch can be fitted with either steel or synthetic cable. As both winches are pulling cable in after cable release, any sideways bow in the cable can be almost pulled straight before the cable lands, so it actually handles cross-winds better than with conventional parachute decent. 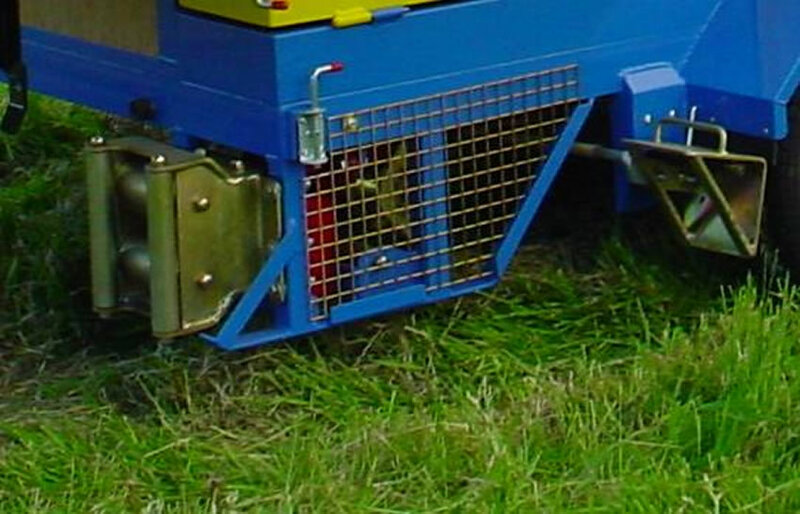 Cable drum braking is controlled by a tension roller, so if there is a break (at high speed) the drum will automatically stop, leaving less than 5 turns of loose cable on the drum. Both cables can be easily rejoined in the normal way. 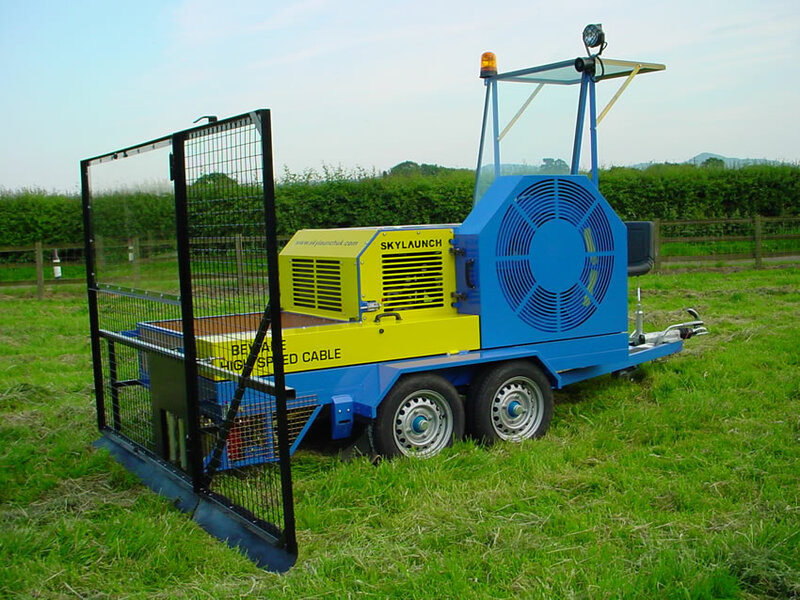 For low simulated cable breaks, the cable is allowed to drop then retrieved as normal, when the airfield is clear. For high simulations, cable can be retrieved as normal in a lower speed setting. This can happen occasionally as so many (unskilled) drivers operate these winches. The end of the cable is attached to the launching cable with a simple knot, acting as a weak link. 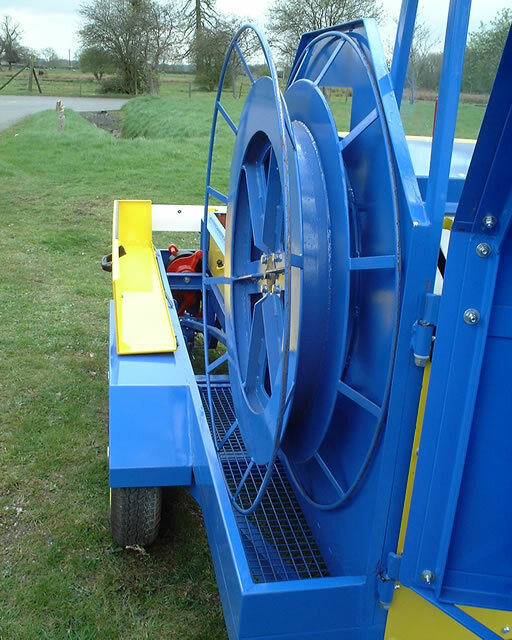 Because the cable drum brake is automatically applied, there will be no problem and the cable is simply reconnected, taking approximately two minutes. Typically, 45 seconds or less from glider release to cable back at the launch point, ready for next launch (see analysis of cable retrieving systems). The launch and retrieve all happen as one rapid cycle, so the cable is quickly returned to the launch point to await the next launch. Approximately 0.2 litres per retrieve, usually the same amount of fuel used by the launching winch to reel the cable end all the way in (when using a vehicle retrieve system). This also eliminates the fuel requirement of any cable retrieve vehicle. Yes, power unit is reliable Volkswagen, final drive utilizes popular industrial components. 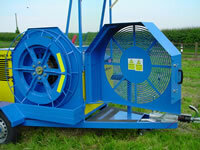 Brake system / guillotine / cable rollers / small fittings etc are standard parts as used on the Skylaunch launching winches. Wheels / axles / tow hitch etc are universal trailer components. 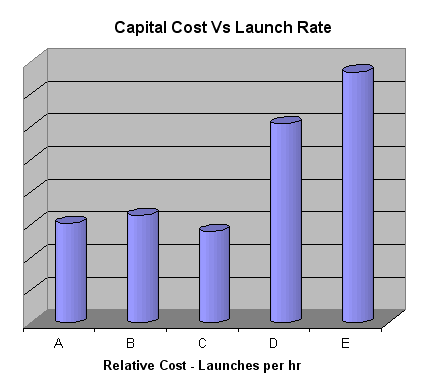 Basic service is every 6,000 launches (retrieves). The running costs will be significantly less than operating a vehicle retrieve system. Yes. 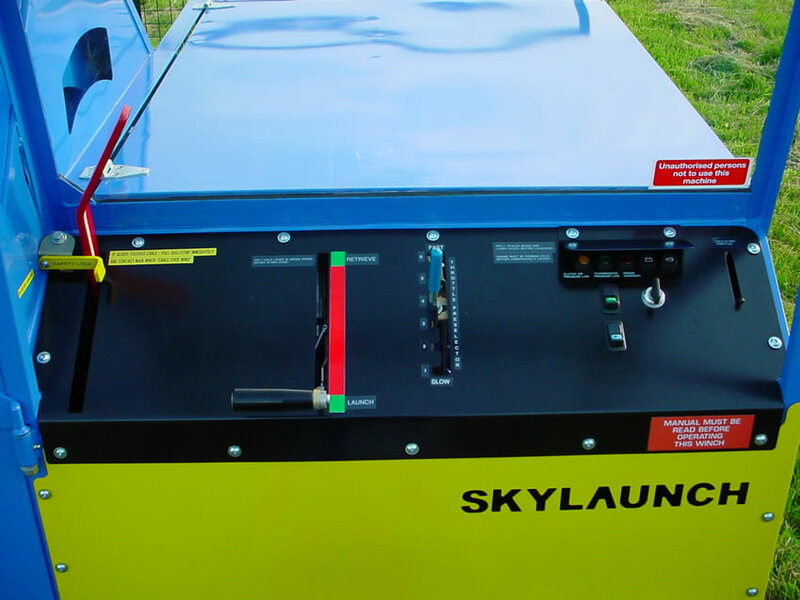 The first Skylaunch retrieve winch was delivered in 1994 to a busy club launching (retrieving) approximately 10,000 gliders per annum, has proven to be very reliable and is still used every day. Camshaft drive belt and tensioning roller. Includes minimum equipment for launching and retrieving cable(s) but not for movng winches (if not the same). Based on new winch prices (approximate). Estimated prices for appropriate size of towing cable vehicle (used) in good working order. Assuming 1 person operates both winches - example D.
Assuming winch operator does not tow back cables. Manuals (manuals in other languages are available at extra cost).